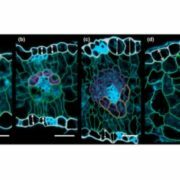 Abscisic acid (ABA) promotes stomatal closure and inhibits light-induced stomatal opening. 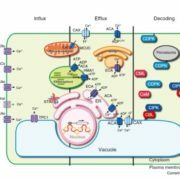 An early event in ABA signaling is an influx Ca2+ ions across the plasma membrane and an increase of cytoplasmic calcium ([Ca2+]cyt). 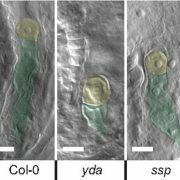 ABA-induced stomatal closure involves an outward K+ flux and dynamic vacuolar remodeling. 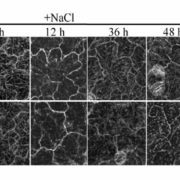 Calcium sensors, such as Calcineurin B-like proteins (CBLs) interact with and activate CBL-interacting protein kinases (CIPKs) during Ca2+ signaling. 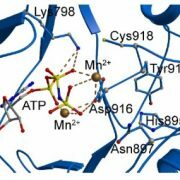 CBL-CIPK complexes are associated with the PM or the tonoplast. 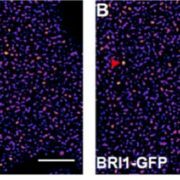 PM-associated CBLs and their interacting CIPKs have been suggested to act as “brakes” in ABA signaling, as their mutation resulted in hypersensitivity to ABA during seed germination and stomatal movement. However, little is known about the role of CBL-CIPKs at the tonoplast. It is known, however, that the tonoplast association of Arabidopsis CBL2 and CBL3 depends on the protein S-acyl transferase (PAT) activity of PAT10. Song et al. 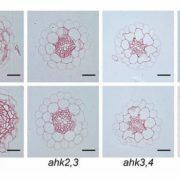 (10.1104/pp.18.00377) report that pat10-1, a null mutant of Arabidopsis PAT10, is hypersensitive to ABA-induced stomatal closure and vacuolar remodeling. A similar phenotype was observed in cbl2 cbl3, the double mutant of CBL2 and CBL3, whose tonoplast associations depend on PAT10. The functional loss of the PAT10-CBL2/CBL3 system resulted in enhanced Ca2+ influx and [Ca2+]cyt elevation. 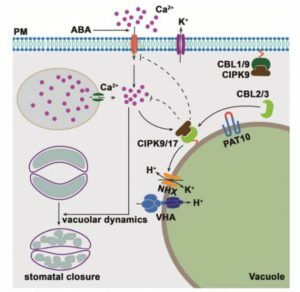 The Promotion of vacuolar K+ accumulation by the overexpression of NHX2, a gene that encodes for a Na+,K+/H+ antiporter, suppressed ABA-hypersensitive stomatal closure and vacuolar remodeling of the mutants, suggesting that PAT10-CBL2/CBL3 positively mediates vacuolar K+ accumulation. 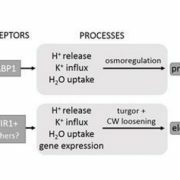 The functional loss of the PAT10-CBL2/3-CIPK9/17 system in guard cells enhanced drought tolerance. 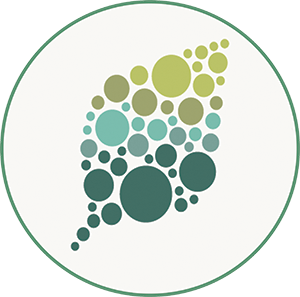 The authors propose that the tonoplast CBL-CIPK complexes form a signaling module, negatively regulating ABA signaling during stomatal movement.